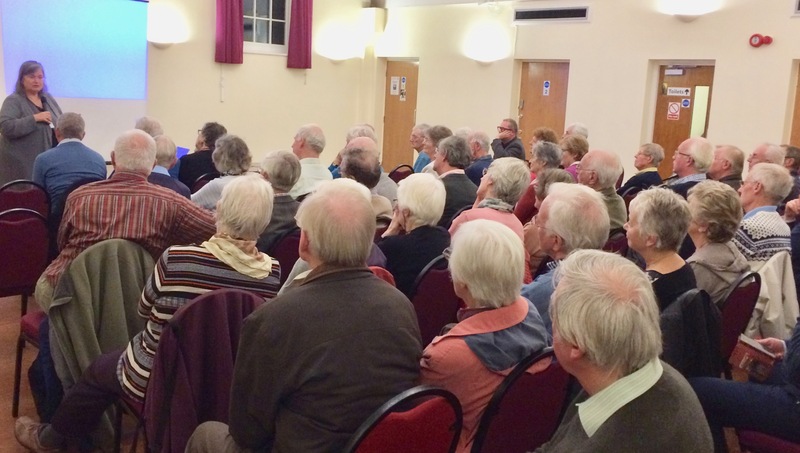 At the Harpenden Society’s well-attended October meeting, the planning portfolio holder on St Albans District Council Mary Maynard provided an update on preparation of the council’s revised Local Plan (LP). The word ‘Strategic’ has now been dropped following the rejection of the earlier draft by the Planning Inspectorate, due to SADC’s ‘lack of engagement’ with adjacent authorities, notably Dacorum to the west. Cllr Maynard (above), who in May took over the lead planning role from Cllr Julian Daly, explained that a government-approved Local Plan was needed if definitive planning decisions were to be made locally. Without it, they would be made by officials in London with little or no knowledge or sensitivity about the St Albans area. Crucially, she said, plans for housing needed to take account of demographic changes in recent decades. From 1981 to 2015, for example, the number of households in the UK had risen from 20 to 27 million, of which one-person occupancy had gone up from 20 to 29%. Housebuilding had fallen by around 40% during that period, to about 150,000 per annum nationally, helping to push up prices by an average of 7% each year. It had pushed home ownership for young people progressively and dishearteningly out of reach. For them, she said, ‘affordability has largely gone away, thereby killing incentive’. As a result, in the 25 to 34 age group, home ownership nationally had dropped from around 60% in 1981 to only 30% in 2013/14. In demographic contrast, more than ever of the over-65s now owned their homes. The revised LP, now integrated with what was previously referred to as the Detailed Local Plan (DLP) - the latter not to be confused with Harpenden’s own Neighbourhood Plan was designed to cover SADC’s planning strategy over the period 2020 to 2036. The aim was to have the LP finalised for submission to the Department for Communities and Local Government (DCLG) by March 2019. Under the heading of the council’s ‘duty to co-operate’, planning authorities in the area, notably SADC, Welwyn Hatfield, Dacorum and Central Bedfordshire, were, said Cllr Maynard, obliged, under government ruling, to liaise with each other in meeting the whole area’s housing need. That would involve fresh consultations and a new ‘call for (housing development) sites’. The LP needed to deliver employment as well as housing need and also supporting infrastructure. Many in the Harpenden Society audience were cautiously gratified to hear Cllr Maynard say that ‘protected green belt’ also needed to be delivered’, though her assertion was notably lacking in specifics. And she added, perhaps ominously, that ‘government will, where necessary, trigger policy responses ensuring that further land comes forward’. Determination of housing need (numbers and categories) was subject to a revised ‘methodology’ being set by the DCLG, which was due to come into force for LPs (necessarily including SADC’s) submitted after March 2018. Cllr Maynard acknowledged that ‘housing need’ in St Albans District, within the LP’s terms of reference, should include no big houses with 4+ bedrooms. Nevertheless, applying the new DCLG-mandated methodology more than doubled the total of new homes required to be built - compared with former SLP numbers - from 450 to 913 per annum. That implied a total increase from 9000 to 14,500 homes to be built in the district in the new LP’s 16-year time frame. And in apparent denial of the previously-mentioned need for ‘delivering green belt protection’, 9500 of those would need to be built on green belt land. But, in a sign of equivocation in Whitehall, Cllr Maynard spelled out the ‘Government Green Belt Approach’ as follows: Authorities should amend green belt boundaries only when they can demonstrate that they have examined fully all other reasonable options. Those options included making effective use of suitable brownfield sites, densification (locally, in Harpenden and St Albans town centres) and exploring whether adjacent authorities’ land could help to meet the requirement. That last option, which Cllr Maynard likened to ‘a game of musical chairs, where the players carry their chairs round with them’, was clearly the stumbling block over which the former SLP was rejected. Within the scope of the government-decreed methodology on determining housing need , were ‘opportunities to improve’ - deemed to include a minimum percentage of affordable housing for locally-based ‘key workers’ and for older people wanting to downsize. In that context Cllr Maynard said SADC was talking to housing associations about the requirement for new social housing, though care was being taken to safeguard its ongoing affordability - something which, in Harpenden, could be positively ensured only on the Westfield allotment site where the land was council owned. To see the slides from this meeting click here.